Gigantic, exotic and gargantuan, baobab tree is special. Learn how to grow a baobab tree as growing baobab tree is not that difficult if you understand the basics. 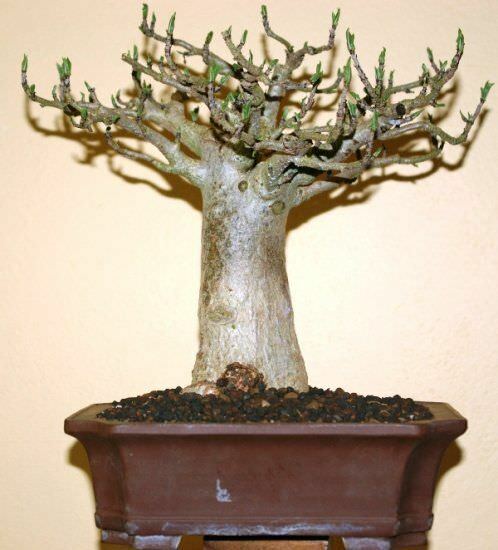 You can also make a baobab bonsai, it looks superb. What is a Baobab Tree? Baobab is a low maintenance tree and regarded as world’s largest succulent. It can also be grown in pot, baobab bonsai is famous and is particularly well suited for beginners and if you have a large backyard, you can grow it outside. The baobab tree flourishes on poor soils, tolerates heat and has the ability to store large amounts of water, to survive in drought. Other Names: Adansonia (scientific name), boab, boaboa, tabaldi, bottle tree, upside-down tree, and monkey bread tree. Before sowing, the Baobab seeds needs soaking at room temperature. For this, soak the seeds for one day in warm water. After that, scarify the baobab seeds on sandpaper to expose their inner white layer. Dry seeds indoors for a day before planting. The germination rate of baobab seeds is low, so sow 3 times more seeds than required. Sow baobab seeds 1 to 2 inch deep and keep the soil temperature above at least 15 degrees Celsius. It is important to keep soil evenly moist, but not kept wet. Once the roots are formed, baobab can be planted into individual pots or on the grounds. The pot you use should have a minimum diameter of seven centimeters. The germination of baobab seeds is sporadic, their germination can take anywhere from a week to a month. The cultivation of baobab from seed requires some patience. Because in some cases, the germination can take several months. Baobab tree can also be grown from cutting. For this, take cutting in spring from the tree. The cuttings should have at least three leaves. After taking a cutting, let it dry for a few days to reduce the chances of fungal attacks and stem rot. After that, plant the cutting in soil mixture of sand and peat. Growing baobab tree requires at least 6 hours of direct sunlight, it appreciates as much sun as given. 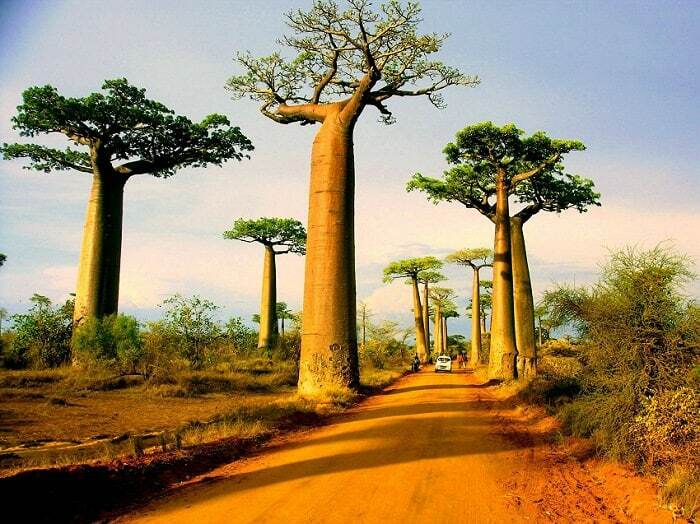 If baobab receives too little daylight, it grows slowly and spindly and leaves turns yellow. In order to create the optimum soil conditions for the baobab, soil must have good drainage and should be sandy. To make baobab soil at home, mix 3 parts of compost, 2 parts of sand in 1 part soil. However, best to buy premixed cactus soil. This allows better aeration of the soil and prevents the roots rot. Watering requirement of baobab is moderate to low as it is native to arid areas of Africa and it should be done carefully. If you’re growing baobab in container, choose one with good drainage holes, so that the excess water can seep out from bottom. Overwatering should be avoided. Before watering the plant again, always check if the soil is dry. If it is moist, do not water. As baobab is very tolerant to droughts, do not water if unsure. Mature baobab tree on ground does not need any fertilizer. Fertilize young and potted plant with liquid succulent fertilizer that is high in potassium and low in nitrogen every month. Taking care of a baobab is simple. The sturdy exotic plant loves warm, sunny and bright location. Larger specimens survive longer drying sessions. Seedlings, on other hand need more water and should be kept moderately moist. Baobab tree if grown successfully, rewards you not only with its ornamental thick trunk and rich green leaves, but also with large white flowers and edible fruits. Knowing how to grow a baobab tree is not as difficult as overwintering it especially if you’re living in extremely cold climate. You’ll need to do a lot of care to overwinter it. 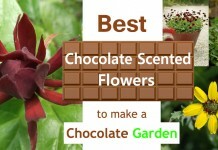 Place it indoors, in a bright and warm position near a windowsill. Try to keep temperature around 10 C, lower than this will stunt baobab. In winter, baobab tree drops its leaves and goes to dormancy. During this time water sparingly, watering in winter can cause root rot. Also stop to fertilize. In the spring, place it back at its usual location. Resume watering when buds begin to swell. Baobab tree can be easily made into a bonsai. If you are growing baobab trees in pot, repotting is necessary. The growth of baobab roots is very strong. Therefore, the tree requires enough space to unfold. Repot baobab when plants seems root bound, roots starts to appear on upper surface. The baobab tree can be pruned throughout the year except winter. It’s easy, simply remove the shoots, which are located under the main crown. If possible, make a cut near bud. So a new bud of the branch will be ensured. In order to cut individual branches summer is the ideal time. Some common pests that attracts on baobab tree are mealybugs, spider mites and fungus gnats. 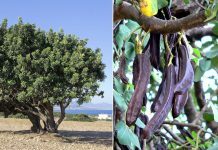 It has strong branches, impressive trunk and fleshy leaves. Baobab tree forms large white flowers after a few years of growing, it also produces fruits that taste well and provide energy. Fruits are rich in calcium and slightly acidic. Baobab tree is drought tolerant and has the ability to store large amounts of water in its trunk and roots. It is forgiving, robust and low-maintenance plant. Baobab tree is a long living tree, it can live up to 1000 of years. do you sell bulbs or cuttings ? Hi Giacomo Isgro’, thanks for your interest on our website. You can easily grow baobab although we don’t sell seeds or plants. If you want to grow it, please check locally or buy online. Hi Greta, You can pinch the tips (end of branches) after it has grown 3-4 leaves to keep it small and make it bushy. If you want to make bonsai of it, this article might be helpful. Sometimes the shell stays in the soil and the sprout just pushes through it. So make sure the aerial part that you are calling root are not the leaves. Did you germinate the baobab seeds in dark? Are all seeds germinated upside down? Are you strictly following the method written in our article? If the seed really germinated upside down, it may not live. Still, you can try to transplant it to the right position. Cool Article ! I love Baobab Trees I grew a few in pots, they like warm weather best. Thanks for your post. We grow baobab in west Africa and we find it germinates much faster and more consistently if you soak the seeds over night or until the outside is soft and squidgy. If you will plant in the afternoon, in the morning you can put the seeds in a clear plastic bag in water and leave it the the sun for the day. I learned that from our 71 year old nursery man who retired last year. We are having bad problems with root rot. Any ideas apart from limiting water and improving drainage? Hi . 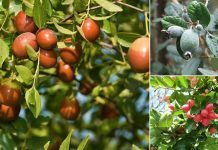 I have 2 boab seed pods , they both rattle when I shake them , are they no good to plant or do I take the bit insde the nut and plant that bit as per you insructions . Hi, looking to start a baobab bonsai, and will try grow it, but even better would love to buy an established tree. Having a really hard time finding either online. Any tips? If I have to follow all these complicated instructions to get Baobab seeds to sprout and grow into a Baobab tree, how do they manage to do it on their own in the wild?